Wind energy is one of the most popular energy technologies, with the UK being the windiest country in Europe. Harnessing the natural power of the wind is essential to tackle global warming. Envirotek are UK manufacture of low cost, high quality vertical axis wind turbines (VAWT). Being small in size, they are suitable to be shipped world wide. 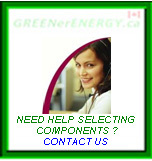 They can provide a useful power source for small load applications including energy efficient lighting in remote areas. 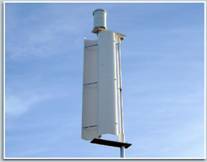 The Envirotek V20 is a small, low cost, two blade Savonius vertical axis wind turbine. It is a safe, quiet and environmentally friendly alternative to conventional propeller type generators. Designed to maintain battery charge in remote installations including traffic signs, network transmitters, CCTV, electric gates and farm lighting. Unlike solar panels and with the right conditions, the vertical axis rotor can give a 24 hour "Top-Up" charge. No more lugging heavy batteries back and forth! How Does a Vertical Axis Wind Turbine Work? The V20 rotates in a vertical plane driving a permanent magnet alternator. Although VAWT turbines are not as efficient as horizontal, they are virtually silent in operation and visually unobtrusive. Rotor size: 300 mm D x 1000 mm L.
This can vary due to size and condition of battery. Voltage Controller (optional) 12V- 10A - solar panels can be integrated. Materials: Blades are manufactured from plastic with stainless steel shaft. Plastic casing and blades with stainless steel central shaft and fittings create an extremely tough storm proof vertical axis wind turbine VAWT. Robust permanent magnet alternator encapsulated inside upper compartment. Bridge diodes included producing DC. 12V 10A charge controller is available and maintains lead-acid batteries in fully charged state. Improves performance & extends life by preventing overcharging. If you have solar panels, you can integrate the V20 with the controller. The installation of the unit has been made simple. The V20 comes complete with the clamping kit. This allows the wind turbine to be fitted directly to a tube 33 mm diameter. Unique subtle design is visually unobtrusive. Compact, lightweight (10Kg), and low maintenance. Simple and easy to follow installation. Ideal for maintaining battery charge in small load applications. The V20 comes complete with a clamping kit. This allows the wind turbine to be fitted directly to a tube 33 mm diameter. Cost & Performance Calculators - World Historical Climate & Weather Data - Installations - Need Help Selecting Components? Contact Us!